PARTNER DER HOTELLERIE UND GASTRONOMIE. Partner of hotel sector and gastronomy. DESIGN UND INNOVATION: AUSGEZEICHNET! DESIGN AND INNOVATION: AWARDED! Für jeden Anlass das perfekte Glas. Individuelle und kreative Ideen für Ihre Marke. The perfect glass for every occasion. Individual and creative ideas for your brand. Mit bedruckten Gläsern lassen sich Marken, Unternehmen und Anlässe ästhetisch ansprechend in Szene setzen. Top-Restaurants, Hotels, Winzer und renommierte Weinhändler nutzen unsere Kollektionen ebenso wie Airlines, Kreuzfahrtschiffe und Marken rund um den Globus. Printed glasses are an ideal medium for aesthetic presentation of brands, companies and occasions. Top restaurants, hotels, winemakers and renowned wine merchants use our collections just as airlines, cruise ships and top brands around the world. Das Glas der Profis. The glass of the professional. DEN MOMENT GENIESSEN. SAVOUR THE MOMENT. Gehört zum Leben. Belongs to life. INSPIRED BY PROFESSIONALS, DESIGNED WITH PASSION. Global partnership, individual services: thanks to its cooperation with top restaurateurs, sommeliers and renowned designers, ZWIESEL KRISTALLGLAS has become one of the leading partners for hotels, restaurants and trade all over the world. With its brands ZWIESEL KRISTALLGLAS is one the most successful companies in the sector and at the forefront in terms of design and innovation. Numerous awards and design prizes proof this. Mit zeitgemäßen Produkten und maßgeschneiderten Services für unsere Partner setzen wir seit Jahren Standards. Die Marken ZWIESEL 1872, SCHOTT ZWIESEL und JENAER GLAS spiegeln mit ihren nachhaltigen, innovativen Produkten diese Philosophie wider. 6 ZWIESEL KRISTALLGLAS. Partner für Hotellerie und Gastronomie. Partner of hotel sector and gastronomy. ZWIESEL KRISTALLGLAS ist „Weltmarktführer Champion 2018“ im Segment Kristallglas für gehobene Hotellerie und Gastronomie. ZWIESEL KRISTALLGLAS is the “World Market Leading Champion 2018” in the segment of crystal-glass makers for high-end hotels and restaurants. WirtschaftsWoche und Hochschule St. Gallen prämieren beste Unternehmen Deutschlands. Wirtschaftswoche magazine and the University of St. Gallen have awarded a prize to the best company in Germany. Der Weltmarktführer-Index hat die ZWIESEL KRISTALLGLAS AG als ‚Weltmarkt­ führer Champion 2018’ im Segment „Kristallglas für gehobene Hotellerie und Gastro­nomie“ ausgezeichnet. In the World Market Leader Index, ZWIESEL KRISTALLGLAS was awarded the title of “World Market Leading Champion 2018” in the segment of crystal-glass makers for high-end hotels and restaurants. The World Market Leader Index is collated by the University of St. Gallen and the German Academy of World Market Leaders with media partners Wirtschaftswoche magazine. The top performers in a total of six categories are selected from 20 industries. In insgesamt sechs Kategorien werden die Top Leistungsträger aus 20 Branchen gekürt. Mehr als 3.000 Partner aus der Hotellerie, Spitzengastronomie und Handel vertrauen weltweit unseren hochwertigen Produkten. Neben einem Partnernetzwerk aus internationalen Hotelgruppen, Caterern, Fluggesellschaften und Cruise Lines, ist ZWIESEL KRISTALLGLAS exklusiver Glaspartner vieler Luxushotels und exklusiver Restaurant- und Weinverbände. Sterneköche schätzen die edlen Gourmetglasserien und innovativen Produkte im täglichen Einsatz in ihren Restaurants. More than 3000 partners in hotels, top restaurants and trade worldwide rely on our high-quality products. 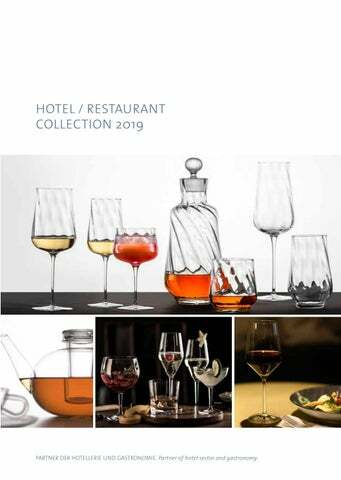 In addition to maintaining a partner network of international hotel chains, caterers, airlines and cruise lines, ZWIESEL KRISTALLGLAS is the exclusive glass partner of many luxury hotels and select restaurant and wine associations. Award-winning chefs use and appreciate the exceptional collections of gourmet glasses and innovative products in their restaurants. 8 ZWIESEL KRISTALLGLAS. Partner für Hotellerie und Gastronomie. Partner of hotel sector and gastronomy. NACHHALTIG PRODUZIERT FÜR REINEN GENUSS. ZERTIFIZIERT FÜR OPTIMALES UMWELTMANAGEMENT. SUSTAINABLY PRODUCED FOR PURE PLEASURE. CERTIFIED FOR OPTIMAL ENVIRONMENTAL MANAGEMENT. ZWIESEL KRISTALLGLAS engagiert sich aktiv für das Thema Umwelt. Unser Ziel ist es, unsere Produkte mit wenigen Res­sourcen und unter bestmöglicher Energienutzung herzustellen und die Umwelt nicht unnötig zu belasten. Mit dem zertifizierten Umweltmanagementsystem ISO 14001:2004 werden wir dieser Verantwortung gerecht und optimieren permanent interne Prozesse. Ziel unserer Bemühungen ist eine ganzheitliche und nachhaltige Ökobilanz für alle unsere Prozesse und Produkte. Bereits 2010 wurde für Tritan®-Kristallglas ein von einem unabhängigen Institut erstelltes Ökoprofil und ein ökologischer Fußabdruck (Carbon Footprint) verliehen, den wir im täglichen Prozess stetig weiter optimieren. ZWIESEL KRISTALLGLAS actively strives to protect the environment. To achieve our objective of placing the smallest possible burden on the environment, we consume as few natural resources as possible and we make optimal use of energy when we manufacture our products. We live up to this responsibility and continually optimize our in-house processes with the certified ISO 14001:2004 environmental management system. The goal of these efforts is a holistic and sustainable ecological balance sheet for all our processes and products. From an independent institute, 2010 we have received for our Tritan® crystal glass an ecological profile and a carbon footprint, which we continuously improve in our daily process. bringen Genuss perfekt zum Ausdruck. high standards and the passion for the finest things. They are timeless, elegant and perfectly reflect the wine’s character and aroma. The ability to personalise our living space is therefore of utmost importance. COLLECTION provides pure elegance and timeless beauty. 10 ZWIESEL KRISTALLGLAS. Partner für Hotellerie und Gastronomie. Partner of hotel sector and gastronomy. making the series a perfect fit for a wide range of wines. freie Entfaltung der Aromen. Genau wie die Rose sind die Kelchgläser vielfältig einsetzbar, sodass sich die Serie perfekt für ein breites Spektrum an Weinen eignet. 12 ZWIESEL KRISTALLGLAS. Partner für Hotellerie und Gastronomie. Partner of hotel sector and gastronomy. Handmade by our glassmakers in Zwiesel, every piece is a unique work of art. sind diese Gläser: Mundgeblasen von unseren Glasmachern in Zwiesel ist jedes Glas ein Unikat. 14 ZWIESEL KRISTALLGLAS. Partner für Hotellerie und Gastronomie. Partner of hotel sector and gastronomy. und inspirierendes Design zu entwickeln. exceptional concept series AIR SENSE is inspired by a function driven design. The series with its integrated glass decantation is a sensory highlight. Bernadotte & Kylberg is a global design agency established in 2012 by Carl Philip Bernadotte and Oscar Kylberg. The Swedish design duo has created designs for a range of leading brands, both domestic and international. Their design philosophy is to create iconic and inspiring design that lasts. 16 ZWIESEL KRISTALLGLAS. Partner für Hotellerie und Gastronomie. Partner of hotel sector and gastronomy. * * Informationen zu DROP PROTECT finden Sie auf Seite 92. Please find information about DROP PROTECT on page 92. Vier sensorische Welten, fünf Formen. Four sensory worlds, five shapes. Die Konzeptserie SIMPLIFY verfolgt eine ganz besondere Philo- The SIMPLIFY concept series adheres to a special philosophy: every sophie: Jedes Glas ist für Weiß- und Rotwein gleichermaßen geeig- glass is equally suited to both red and white wine. This means that net. Mit nur fünf Grundformen lassen sich so alle Weinstile und all wine styles and aromas can be represented with just five Aromen abbilden: LEICHT & FRISCH, FRUCHTIG & FEIN, SAMTIG & ÜPPIG, basic shapes: LIGHT & FRESH, FRUITY & DELICATE, VELVETY & KRAFTVOLL & WÜRZIG. 18 ZWIESEL KRISTALLGLAS. Partner für Hotellerie und Gastronomie. Partner of hotel sector and gastronomy. Das Aroma entscheidet. LEICHT & FRISCH Schlank schmeckende oder feinperlige Weine fühlen sich in diesem Glas besonders wohl. Der für das LEICHT & FRISCH-Glas perfekt geeignete Wein ist nicht zu alkoholreich, hat einen grazilen Körper und eine frische Lebendigkeit. LIGHT & FRESH Lean-tasting or fine sparkling wines are especially suited for this glass. The ideal wine for the LIGHT & FRESH glass is not too rich in alcohol, but has a delicate body and a fresh vitality. VELVETY & SUMPTUOUS Dark fruits, oriental spices and a soft aromatic finish – these wines sensually flow over the gums in SIMPLIFY VELVETY & SUMPTUOUS. The tannins are harmoniously integrated through purification or maturation, while the alcohol strengthens the finish. FRUCHTIG & FEIN Animierende Weine, die ausgeprägt fruchtig schmecken – perfekt für diese Glasform. Süße und Säure im feinen Dialog, Leichtigkeit auf Gaumen und Zunge. LEICHT & FRISCH: SEKT Schlank schmeckende oder feinperlige Weine fühlen sich in diesem Glas besonders wohl. Der für das LEICHT & FRISCH-Glas perfekt geeignete Sekt ist nicht zu alkoholreich, hat einen grazilen Körper und eine frische Lebendigkeit. FRUITY & DELICATE Stimulating wines that typically have a distinctly fruity taste, perfectly suited for this glass shape. Sweet and sour in delicate dialogue, lightness on the gums and tongue. FLAVOURSOME & SPICY Flavoursome, dense wines with tannin, fruit and rich in alcohol mostly like SIMPLIFY FLAVOURSOME & SPICY. A high colour density and a firm tannin structure give the wines an aromatic flavour and a fantastic finish. LIGHT & FRESH: SPARKLING Lean-tasting or fine sparkling wines are especially suited for this glass. The ideal sparkling wine for the LIGHT & FRESH glass is not too rich in alcohol, but has a delicate body and a fresh vitality. Weise. Fruchtige Noten und würzige Eindrücke werden noch authen- authentically. tischer wahrgenommen. 20 ZWIESEL KRISTALLGLAS. Partner für Hotellerie und Gastronomie. Partner of hotel sector and gastronomy. 22 ZWIESEL KRISTALLGLAS. Partner für Hotellerie und Gastronomie. Partner of hotel sector and gastronomy. Eine Hommage an die Barkultur. A homage to bar culture. Barkultur und verbindet Ästhetik und Genuss auf einzigartige Weise. collection is characterised by gently drawn stems and softly curving radii. Three distinctive cutting styles create a unique play of light and colour. Schliff­arten schaffen ein unverwechselbares Spiel mit Licht und Farbe. 24 ZWIESEL KRISTALLGLAS. Partner für Hotellerie und Gastronomie. Partner of hotel sector and gastronomy. 26 ZWIESEL KRISTALLGLAS. Partner für Hotellerie und Gastronomie. Partner of hotel sector and gastronomy. aromas and is sure to delight your guests. 28 ZWIESEL KRISTALLGLAS. Partner für Hotellerie und Gastronomie. Partner of hotel sector and gastronomy. When only the best is called for. THE FIRST stands for individual joie de vivre. A wine culture like no other. the secrets of the finest wines. 30 ZWIESEL KRISTALLGLAS. Partner für Hotellerie und Gastronomie. Partner of hotel sector and gastronomy. 32 ZWIESEL KRISTALLGLAS. Partner für Hotellerie und Gastronomie. Partner of hotel sector and gastronomy. Auserwählte Gläser für ausgewählte Weine. Selected glasses for exquisite wines. ENOTECA bildet ein Ensemble von nicht weniger als 25 Gläsern und folgt dem luxuriösen Anspruch, jedem Wein zu seiner individuellen Entfaltung und Präsentation zu dienen. Die brillanten Kelche bilden feinste Farb­ nuancen ab. Zugleich erlaubt die präzise Bestimmung der Wandstärke die weingerechte Temperaturerhaltung für die differenzierten Sorten und Reben. So schaffen sieben Rotweingläser, die große Weine „aufblühen“ lassen, vier Weißweingläser und differenzierte Gläser für Prosecco, Sekt, Champagner, Spirituosen und Wasser eine Enzyklopädie für wahre Kenner. providing the connoisseur with the finest tools to relish a wine or spirit’s unique medley of colour, aroma and flavour. The brilliant glasses catch and reflect even the most delicate nuances of colour, while precise specifications for wall thickness help to keep wines at the most appropriate temperature. And so, seven glasses for red wine, four for white wine and an assortment for Prosecco, sparkling wines, champagne, spirits and water create an encyclopaedia for true connoisseurs. 34 ZWIESEL KRISTALLGLAS. Partner für Hotellerie und Gastronomie. Partner of hotel sector and gastronomy. 36 ZWIESEL KRISTALLGLAS. Partner für Hotellerie und Gastronomie. Partner of hotel sector and gastronomy. 38 ZWIESEL KRISTALLGLAS. Partner für Hotellerie und Gastronomie. Partner of hotel sector and gastronomy. edges seem to invite caresses. A highlight on each table. SCITA GLAM makes an elegant and sensual statement in glamorous purple. bottom, created by a special production technique. 40 ZWIESEL KRISTALLGLAS. Partner für Hotellerie und Gastronomie. Partner of hotel sector and gastronomy. in über 130 Ländern schätzen die Marke als verlässlichen Partner. acclaimed chefs and top hotels in over 130 countries value the brand SCHOTT ZWIESEL as a reliable partner. the latest trends which have been awarded numerously. 42 ZWIESEL KRISTALLGLAS. Partner für Hotellerie und Gastronomie. Partner of hotel sector and gastronomy. Doppelt bruchfest: das neue TRITAN® PROTECT. Twice the break strength: the new TRITAN® PROTECT. Tritan®-Kristallglas. Das ökologische Glas für besonderen genuss. Tritan® crystal glass. The environmentally friendly glass for special moments. sensorisch perfekt ausbalanciert und optimal an die bekanntesten Weinstilistiken angepasst. sensory balance and is optimally suited to the most renowned wine styles. An exceptional drinking experience in terms of look and feel is therefore guaranteed. 44 ZWIESEL KRISTALLGLAS. Partner für Hotellerie und Gastronomie. Partner of hotel sector and gastronomy. DAS AROMA ENTSCHEIDET. THE AROMA DECIDES. 46 ZWIESEL KRISTALLGLAS. Partner für Hotellerie und Gastronomie. Partner of hotel sector and gastronomy. Animierende Weine, die ausgeprägt fruchtig schmecken – perfekt für diese Glasform. Süße und Säure im feinen Dialog, Leichtigkeit auf Gaumen und Zunge. 48 ZWIESEL KRISTALLGLAS. Partner für Hotellerie und Gastronomie. Partner of hotel sector and gastronomy. Lean-tasting or fine sparkling wines are especially suited for this glass. The ideal wine for the LIGHT & FRESH-glass is not too rich in alcohol, but has a delicate body and a fresh vitality. Dark fruits, oriental spices and a soft aromatic finish – these wines sensually flow over the gums in SENSA VELVETY & SUMPTUOUS. The tannins are harmoniously integrated through purification or maturation, while the alcohol strengthens the finish. Kraftvolle, dichte Weine mit Tannin, Frucht und reichlich Alkohol fühlen sich in SENSA KRAFTVOLL & WÜRZIG am wohlsten. Eine hohe Farbdichte und eine feste Gerbstoffstruktur verleihen einen aromatischen Geschmack mit großartigem Nachhall. Flavoursome, dense wines with tannin, fruit and rich in alcohol mostly like SENSA FLAVOURSOME & SPICY. A high colour density and a firm tannin structure give the wines an aromatic flavour and a fantastic finish. Finest glasses for unique indulgence. Feinheit und Eleganz zeichnen die Gourmet-Stielglasserie FINESSE aus. companion for each type of wine. ably increases the breaking strength and resistance. 50 ZWIESEL KRISTALLGLAS. Partner für Hotellerie und Gastronomie. Partner of hotel sector and gastronomy. for a wide variety of beverage preferences – that’s PURE by SCHOTT ZWIESEL. net. Dies verleiht den Gläsern weltweit echten Wiedererkennungswert. ognition value all over the world. 52 ZWIESEL KRISTALLGLAS. Partner für Hotellerie und Gastronomie. Partner of hotel sector and gastronomy. 54 ZWIESEL KRISTALLGLAS. Partner für Hotellerie und Gastronomie. Partner of hotel sector and gastronomy. complimentary design bring order to a table setting. 56 ZWIESEL KRISTALLGLAS. Partner für Hotellerie und Gastronomie. Partner of hotel sector and gastronomy. Passen perfekt zu VIÑA: VIÑA TOUCH (Seite 78-79) und VIÑA SPOTS (Seite 80-81). Matches perfectly VIÑA: VIÑA TOUCH (Page 78-79) and VIÑA SPOTS (Page 80-81). Diva – anmutig und begehrenswert. Diva – graceful and desirable. unterschiedlichster Getränke abgestimmt. It´s a celebration. For over celebration. For over 20 years. 20 years. 58 ZWIESEL KRISTALLGLAS. Partner für Hotellerie und Gastronomie. Partner of hotel sector and gastronomy. The perfect dialogue between elegance and functionality. the breaking resistance and overall durability. 60 ZWIESEL KRISTALLGLAS. Partner für Hotellerie und Gastronomie. Partner of hotel sector and gastronomy. 62 ZWIESEL KRISTALLGLAS. Partner für Hotellerie und Gastronomie. Partner of hotel sector and gastronomy. Lifestyle für Genießer. Das Design macht den Unterschied. Lifestyle for gourmets. The design makes the difference. Kristallglas ist besonders brillant, bruch- und spülmaschinenfest. resistant to breakage and dishwasher safe. potential to become a classic. ein echter Allrounder mit Potential zum Klassiker. * mit Moussierpunkt * with Effervescence Point 64 ZWIESEL KRISTALLGLAS. Partner für Hotellerie und Gastronomie. Partner of hotel sector and gastronomy. * * Informationen zu DROP PROTECT finden Sie auf Seite 92. Please find information about DROP PROTECT on page 92. 66 ZWIESEL KRISTALLGLAS. Partner für Hotellerie und Gastronomie. Partner of hotel sector and gastronomy. 68 ZWIESEL KRISTALLGLAS. Partner für Hotellerie und Gastronomie. Partner of hotel sector and gastronomy. ı–ı geeicht ı–ı fillmark 70 ZWIESEL KRISTALLGLAS. Partner für Hotellerie und Gastronomie. Partner of hotel sector and gastronomy. Basic Bar by Charles Schumann. cut SCHOTT ZWIESEL expands its bar collection to form a complete concept. cut, increasing both the quality and the brilliance of the glassware. 72 ZWIESEL KRISTALLGLAS. Partner für Hotellerie und Gastronomie. Partner of hotel sector and gastronomy. Design and function for the professional. im privaten Umfeld sind in dieser Serie perfekt umgesetzt. ment are perfectly applied on these series. 74 ZWIESEL KRISTALLGLAS. Partner für Hotellerie und Gastronomie. Partner of hotel sector and gastronomy. Gedeckte Farben für drinnen und draußen. Muted colours for inside and outside. Die gedeckten Farben der LIFE TOUCH Becher bringen dezente Eleganz The muted colours of the LIFE TOUCH tumblers bring a subtle elegance to the auf den Tisch. Das leicht geschwungene, filigrane Glas schmiegt sich ganz table. The lightly curved, filigree glass nestles very comfortably in your hand. selbstverständlich in die Hand. Farben wie Bernstein, Grün, Blau oder Fuch- Colours such as amber, green, blue or fuchsia give subtle emphasis to the table sia setzen dezente Akzente auf dem gedeckten Tisch und fangen ein Stück settings and catch the sun’s rays, too. Sonnenlicht ein. Wie alle anderen Kollektionen werden auch diese farbigen Becher aus Like all the other collections, these coloured tumblers are manufactured from Tritan®-Kristallglas gefertigt und sind damit besonders robust, alltagstaug- Tritan® crystal glass and are therefore particularly robust, good for everyday lich und spülmaschinenfest. 76 ZWIESEL KRISTALLGLAS. Partner für Hotellerie und Gastronomie. Partner of hotel sector and gastronomy. Drinking pleasure meets enjoyment of life. summer drinks with herbs, and fruity cocktails. LIFE reflects the pure life. hohem Maße bruch- und spülmaschinenfest macht. Soft pastel colours for the table. value of the crystal glasses and guarantees perfect stability. im Bereich der Stiele nochmals erhöht. larly increased in the area of the stems. 78 ZWIESEL KRISTALLGLAS. Partner für Hotellerie und Gastronomie. Partner of hotel sector and gastronomy. A firework for cocktails and soft drinks. Die farbig gestalteten Becher von VIÑA SPOTS in zwei Größen setzen The coloured tumblers from the series VIÑA SPOTS in two sizes are designed Cocktails oder Longdrinks ebenso wie Softdrinks in Bars oder bei Events to present memorable cocktails, long drinks or soft drinks in bars or at events. gekonnt in Szene. Die Serie VIÑA SPOTS lässt sich zudem optimal mit anderen Kristallglasse- The series VIÑA SPOTS can also be used in combination with other crystal glass rien zu innovativen Tablesettings kombinieren. series to create innovative table settings. 80 ZWIESEL KRISTALLGLAS. 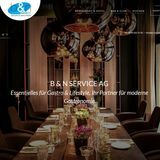 Partner für Hotellerie und Gastronomie. Partner of hotel sector and gastronomy. 82 ZWIESEL KRISTALLGLAS. Partner für Hotellerie und Gastronomie. Partner of hotel sector and gastronomy. Für die besten Biere der Welt. For the world´s best beers. men in Szenebars ebenso wie in der gehobenen Gastronomie. Die Serie bars and upscale gastronomy. The series BEER BASIC by SCHOTT ZWIESEL is BEER BASIC ist mit seinen eleganten Formen der perfekte Begleiter. freshly tapped and optically also cuts a good figure in the glass. macht auch optisch eine bessere Figur im Glas. 84 ZWIESEL KRISTALLGLAS. Partner für Hotellerie und Gastronomie. Partner of hotel sector and gastronomy. THE PERFECT GLASS FOR THE NEW BEER MOVEMENT. BEER BASIC CRAFT widmet sich mit seinem Formenkanon den neuen, handwerklich gebrauten Craftbieren von IPA bis hin zu Stout, Dark Ale oder Wheat Beer. Gemeinsam mit Experten hat SCHOTT ZWIESEL ein Konzept entwickelt, das perfekt an die Vielfalt der Aromen dieses neuen Genusstrends angepasst ist. The shape assortment of BEER BASIC CRAFT is dedicated to new craft beers, ranging from IPA to stout, dark ale, or wheat beers. SCHOTT ZWIESEL worked with experts to develop a concept that perfectly matches the variety of flavors in this new gourmet trend. Stapelbare Ästhetik für Cocktails und Longdrinks. Stackable aesthetics for cocktails and long drinks. sigkeiten und Eis ästhetisch auf zwei Ebenen in Szene. liquids and ice at two visible layers. take up less space on shelves. 86 ZWIESEL KRISTALLGLAS. Partner für Hotellerie und Gastronomie. Partner of hotel sector and gastronomy. 88 ZWIESEL KRISTALLGLAS. Partner für Hotellerie und Gastronomie. Partner of hotel sector and gastronomy. 90 ZWIESEL KRISTALLGLAS. Partner für Hotellerie und Gastronomie. Partner of hotel sector and gastronomy. Dekanter: Tropfen für Tropfen ein Genuss. So genießen Sie die Seele des Weines. Decanter: Worth their weight in gold. Relishing a wine’s soul. bei unseren Karaffen und Dekantern wohl überlegt. DROP PROTECT. Stoppt Tropfen, verhindert Flecken. DROP PROTECT. Stops drips, prevents stains. verhindert. So werden unerwünschte Flecken vermieden. 92 ZWIESEL KRISTALLGLAS. Partner für Hotellerie und Gastronomie. Partner of hotel sector and gastronomy. Diva Dekantierset 4tlg. Diva Decanting-Set 4pce. 94 ZWIESEL KRISTALLGLAS. Partner für Hotellerie und Gastronomie. Partner of hotel sector and gastronomy. ı–ı geeicht ı–ı fillmark ı–ı geeicht ı–ı fillmark 96 ZWIESEL KRISTALLGLAS. Partner für Hotellerie und Gastronomie. Partner of hotel sector and gastronomy. WEINDEGUSTATION / WINETASTING Genuss durch Kennerschaft: Professionelles Degustieren. Enjoyment based on connoisseurship: Professional tasting. this highly sophisticated design are perfectly matched to one another. das Zubereiten, Servieren und Aufbewahren von Speisen und Getränken. for the preparation, serving and storage of food and beverages. Vom Ofen auf den Tisch. JENAER GLAS. Ein Glas für alle Fälle. From oven to table. JENAER GLAS. A glass for all eventualities. * Keine schockartigen Temperaturwechsel, z. B. vom heißen Herd in den Kühlschrank. *N  o drastic temperature changes, e. g. from hot stove to the refrigerator. 98 ZWIESEL KRISTALLGLAS. Partner für Hotellerie und Gastronomie. Partner of hotel sector and gastronomy. EIERKOCH / EGG CODDLER Comeback eines Designklassikers. Der Eierkoch von Wilhelm Wagenfeld. Comeback of a design classic. The egg coddler by Wilhelm Wagenfeld. baking pastries, soufflés, sweets and appetizers. Soufflés, Süßspeisen und Amuse Gueules eignet er sich hervorragend. Egg coddler L and egg coddler XXL. Truly great and grandly functional! * Die Form dieses vielseitig verwendbaren Gefäßes ist abgeleitet von den Original­ entwürfen von Wilhelm Wagenfeld (Eierkoch im klassischen Bauhausdesign von 1933). Floating aesthetic. Functional for hot and cold. HOT´N COOL bietet die perfekte Bühne für das zeitgemäße Servieren. heißem Inhalt stets angenehm anfassen. HOT´N COOL products always remain comfortable to the touch, even when they’re filled with piping hot beverages. 100 ZWIESEL KRISTALLGLAS. Partner für Hotellerie und Gastronomie. Partner of hotel sector and gastronomy. 102 ZWIESEL KRISTALLGLAS. Partner für Hotellerie und Gastronomie. Partner of hotel sector and gastronomy. Frische pur – in klarem Design. Die klare Designaussage von JENAER GLAS JUICE fügt sich perfekt in die Kollektion ein. Der Krug in der Größe von 1,5 Liter eignet sich hervorragend zum Servieren von heißen und kalten Getränken. Pure freshness – in a clear design. The clear design statement of JENAER GLAS JUICE fits perfectly into the collection. The Jug of 1.5 liters is excellently well-suited for serving hot or cold beverages. 104 ZWIESEL KRISTALLGLAS. Partner für Hotellerie und Gastronomie. Partner of hotel sector and gastronomy.